In this podcast, the innovators from the Rocket Mass Heater event at the labs continue their discussion. They begin by talking about the Matt Walker Outdoor Cooker Patio Heater. He explains it is just a standard J-tube with and insulative refractor and it is buried in the ground so that it will be at a manageable height to cook on. It has a standard barrel over the top which he cut a whole in the top to make an adjustable burner to make it able to have variable temperatures for cooking burner. They used it to put a smoker on top to smoke the pork for the event. 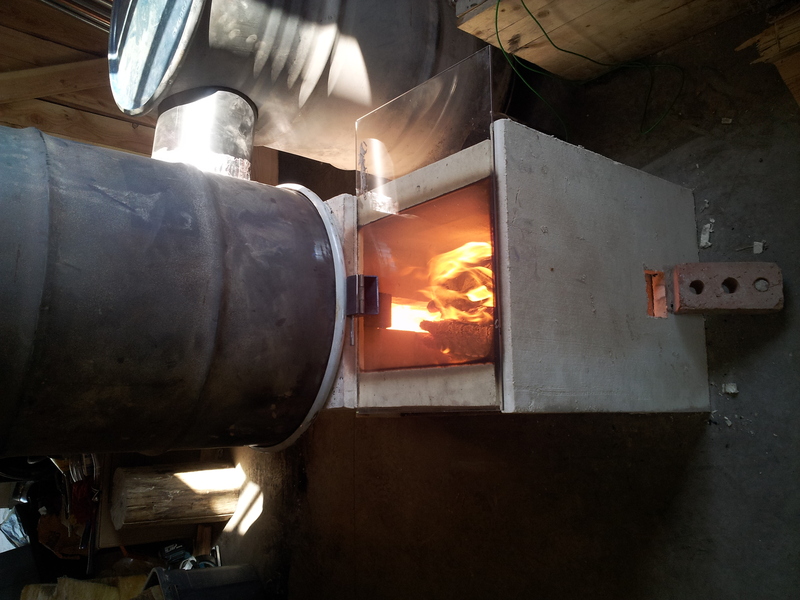 Paul mentions his old rocket stove from a few years ago that just burnt everything to death. Ernie talks a little bit about why the L-tube is pretty much useless compared to the J-tube. Matt then explains in detail the design of his rocket stove and says he gets annoyed when people still assume rocket stoves can only be used for boiling water because his has such a variety of heat. It even uses the heat you don't use to cook to warm the humans. They continue to explain Matt's project and note that it is a rocket stove but it looks like a rocket mass heater that is a 6 inch system with a four inch hole. They talk about how nothing comes out of the hole like ash, and with the J-tube tube you don't have to feed it like the L-tube. They only need put new wood into every 20 minutes or so. The next thing they talk about and what Paul claims to be the prettiest thing, is the batch burner that Peter made. It has glass on the top so you could see the burn and the way it transitions from the batch feed area into the riser area. There is a tall narrow opening and you could tell the flame was swirling and mixing which is so important. They spend a little bit of time discussing the two opposite rams horns effect. So this one is an 8 inch batch burner with double barrel top which the flame is contained it. They talk about even having 3 barrels and how that would work. The cool thing about this system is you'll get a lot of direct heat which is good to have short term heat gain for the shop where there are people there only in the mornings usually. They talk a little bit about the history of batch burners and how to keep them clean. Next they talk about how well the batch burner really did. It ran fine the first time they started it but then later it went haywire and he discusses the details of that. They continue to talk about how they kept testing it over and over. Peter has an analyzer contraption that examines the exhaust which is far hotter than other rocket mass heaters because its burning all the wood at the same time and there is so much more wood in there. This analyzer checks the carbon monoxide and oxygen. Next they talk about how this is a little bit scary because of how hot this is actually getting but Peter reassures everyone it is fine. Erica talks more about the test-o-meters and how most people get mid hundreds and so for Peter's to be below 20 is very very impressive!